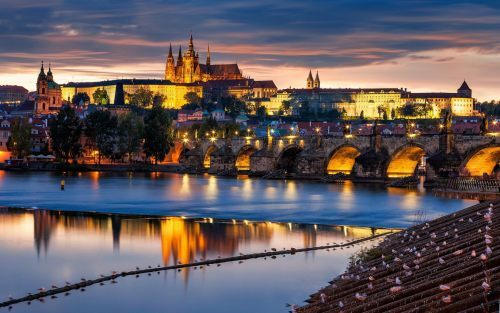 Condor Airlines has dropped the price of their October flights from Vancouver to Prague, Czech Republic down to $732 CAD roundtrip including taxes. 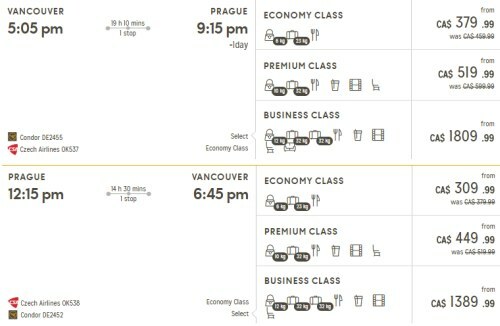 This is about 30% below the typical cheapest roundtrip prices from Vancouver to Prague. The price of the flights will show up as $689 CAD on Condor.com, but it will really end up costing $732 CAD, because Condor bills your credit card in Euros, which means your credit card company adds 2.5% to the transaction (and annoyingly, Condor doesn't mention this during the booking process). Condor also charges an additional fee just for booking with a credit card (18 Euros, or approximately $26 CAD). And again, they don't mention this during the booking process. But all told, with the extra 2.5% foreign currency conversion fee, and the additional 'just for booking with a credit card fee', it will mean that your credit card will be charged a total of $732 CAD instead of the $689 CAD that is displayed on the Condor website. You can also find non-stop flights from Vancouver to Frankfurt on the same dates, for a similar price. If you want to search for a different city instead, try clicking on 'Edit Search' near the top right. The $379 flights are sometimes at the bottom of the list. Click on 'Select' to select the flight. This will allow you to choose the return flight. 3. Scroll down to the return flights. Look for the return dates that are $309 CAD. The $309 flights are sometimes at the bottom of the list. Click on 'Select' to select the return flight. vancouver, yvr, flight deals, eastern europe, europe, frankfurt, fra, western europe, prague, czech republic and condor airlines.